Dianne and I recently took the kayaks out to a spot we visit pretty regularly on Hwy 266. 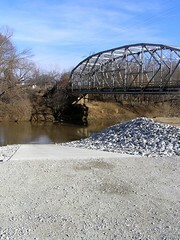 Between Dewar and Grayson they replaced an old metal bridge over the Deep Fork River with a modern concrete eyesore. In the process of doing this they cleared the log jams out of the water and created a large level parking area between the old bridge and the new one. Dianne and i like to paddle this bit of flatwater because it offers easy excercise that is free and close to home. A few weeks ago the Powers-That-Be decided to add a lovely concrete boat ramp. Now, you can put lots of different types of boats into the Deep Fork here and we can paddle it without even getting our feet muddy! On our most recent trip we saw three different groups of boaters taking advantage of the new river access point. It was a very gusty day when we paddled this river last, but one of the benefits of paddling crooked rivers like this is that they offer quite a bit of windbreak. Anyone else find any good paddling spots recently? I must admit that the recent bad weather, combined with the seasonal round of colds, has kept our family from enjoying many adventures lately. Since we have started to get a little cabin fever, Dianne and I decided to use our Christmas shopping excursions to see a little more of the diverse wonderland that is Oklahoma. For the most part, we shop online extensively before venturing out to actually start buying. While I was searching Amazon's massive inventory for gourmet coffee gifts and paddling gear I stumbled across a vendor selling Shiitake mushroom innoculated logs. My Dad gave us a few Shiitake logs one year and we enjoyed having the ample supply of tasty, healthful mushrooms. We pretty much just kicked them out into shady parts of the yard and let the rain water them. This was several years ago back when it used to rain occasionally in the Sooner State. Even being totally ignorant about how to care for them, we raised many pounds of shiitake mushrooms. I was excited about finding a new source for Shiitake logs, but even more excited by the opportunity to have Amazon manage shipping them for me! Even better, when I researched the seller I learned that these were Made-in-Oklahoma Shiitake Mushroom logs! Once I told Dianne she insisted that we make an Oklahoma Road Trip out to visit the Lost Creek Mushroom Farm in Perkins, Oklahoma. 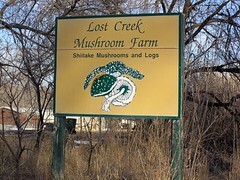 We met Sondra Williams, one of the owners, at the Lost Creek Mushroom Farm and she was kind enough to walk us through the process of creating the innoculated logs. She also took us through her greenhouse and their Strawbale Construction Barn. It was fascinating to learn how this Oklahoma couple launched their own small business that helps people, is not harmful to the environment, and requires such an amazingly low level of technology. Like my Dad's Elderberry Wine, this is an agricultural niche product that is well suited for the extra attention that only a small business can offer. Unlike Dad's Elderberry Wine, the Shiitake Mushroom Logs from Lost Creek Farm are Made-in-Oklahoma products that can be sold and shipped nationwide. The Williams family provides the low tech, land and labor while Amazon provides the high tech infrastructure for this 24/7 fungus marketplace. Visit their website to learn more about the amazing Shiitake Mushroom. Don't let the winter weather keep you locked up inside your home. 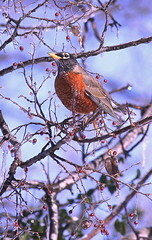 The winter season offers its own delights to those who venture outdoors to witness it. The recent snow here in Okmulgee made for some lovely bird watching days and soon it will be time venture into the night and light up the river in OKC. The 3rd annual Holiday River Parade on the Oklahoma River will light up downtown OKC on Saturday, December 16th, 2006. Over 30 boats, decorated in holiday lights, will parade the river as a spectacular fireworks display adorns the sky. It is an amazing sight to behold and you can't beat the price! The parade viewing areas will open at 3pm on Saturday, Dec. 16th. Activities will begin at 4pm, and the parade starts around dusk with the fireworks display scheduled for 6:30pm. Admission and parking are both free. Want to Enter Your Boat in the River Parade? The deadline to have your boat entered in the parade is noon on Wednesday, December 13th. Entry forms are available from most metro area boat dealers or you can click here to get your Holiday River Parade entry form online. We headed out looking for vivid displays of Fall color in the rapidly changing foliage in our area. Saturday, we took a sunset paddling trip onto Okmulgee Lake, the trees are really bursting with color there now. Now that summer is over officially the traffic at the lake has really slowed down. Sunday, we headed back to the Pierce, Oklahoma area to paddle the North Canadian River. The weather was glorious and the current was faster than our last trip here. The fall color is just starting to show on the sandy, willow-lined banks of this seldom paddled river. We saw three beavers and several waterfowl very close up and had a close encounter with the ultimate anti-kayak. See my Flickr Photos for more details on the Anti-kayak. Finding great fall color anywhere? Drop us a comment! At the confluence of the Arkansas, Verdigris and Grand Rivers is an area historically known as 'The Three Forks' since the 1700s. Three Forks Harbor is immediately south of the east end of the U.S. Highway 62 bridge in Muskogee, Oklahoma. We stopped by on our way back from paddling in Tahlequah. It offers a marina, boat launch and large mobile boat lifter. This makes it a popular fueling and jump-off spot for northeastern Oklahoma recreational boaters to access the rest of the Mississippi River system and the inland water way. Three Forks Harbor's marina has two floating docks with 58 covered slips accommodating vessels ranging from day cruisers to bass boats and houseboats. A 110-ton travel lift is available to move larger boats in and out of the water. The marina provides a 24-hour floating ships store and fuel dock with three pumps. Calico Rock Arkansas Chamber of Commerce is sponsoring its first Kayak Race Oct. 14. 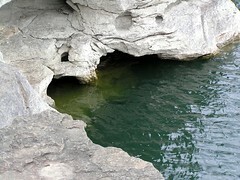 Calico Rock is about 254 miles west of Tulsa and lies right on the banks of the famous White River. At 2 p.m. racers will leave from Lindsey’s Boat Dock on the White River, race downstream, and end at the Calico Rock Bridge. One race will be for individuals and a second for 2-person crews. Each race has a first prize of $250. Spectators can watch the race from the Calico Rock Access, the River Road or the White River Bridge. The entry fee is $30 for each kayak. For a race application or more information, call (870) 297-4129 or stop by the Chamber office on Main Street, Calico Rock Arkansas. Deadline for entry applications is Saturday. The Kayak Race is part of the chamber’s Fall Festival which starts with a 5K race at 9 a.m. and continues with food, music, crafts, art show and other activities beginning at noon in Rand Park (Highways 5 and 56). What a great weekend! Dianne and I had a blast paddling the Illinois River and then enjoyed the night at cool new campground. Rod and Susan Foster invited us to Elephant Rock Nature Park, you can check out the pictures in my Elephant Rock Nature Park Flickr Set. I have passed their sign many times, but I never took the time to drive up the hill and see the place. We have been missing out on a great Illinois River resource for outdoor enthusiasts. The Elephant Rock is one of the most widely recognized landmarks on the Illinois River. I think I got a pretty good picture of it. It looks like an elephant to me. What do you think? Anyone who has read our blog for long, knows that Dianne and I love paddling the Illinois River. Spending the night in some of the Illinois River campgrounds has been a goal of ours for sometime now. Usually, we grab a cabin somewhere quietly hidden away from the summer Illinois River party scene. Elephant Rock Nature Park offered us something more exotic...a Yurt deep in the woods! The Mongolian yurt is a round, usually portable, self-supporting structure designed for camping in comfort. Rather than relying on ropes or stakes to hold itself up, the walls, rafters, roof ring, and tensioning bands all work against each other to keep the structure standing. It is handy structure for camping because all of the interior space is useful living space with no space wasted on tent poles or low sides. The basic yurt collapses down into pieces no longer than 8 feet, so you can chuck it into the back of a truck. The yurts at Elephant Rock have been highly customized to offer all of the comforts of home: refrigerator, stove, A/C, heat, toilet, shower, everything even the kitchen sink... literally. After our invigorating 14 mile paddle down the Illinois River (concluded with a dramatic backwards, toes-in-the-air, fall on my part while attempting to exit the kayak), we were grateful for a comfy night's sleep. Their yurt did not disappoint. The owners of Elephant Rock Nature Park do some volunteer wild animal rehab. We met two deer that they had taken in when they were too tiny to take care of themselves. Now the two deer, June and July, roam the yard at their house playing with guests and the family cat. I scratched a wild baby deer between the ears, it was quite an experience! The park is a 120-acre hardwood and pine forest, right on the river, criss-crossed with well-marked nature trails and tent camping sites. This is over-night river lodging (no RV's) for nature lovers and outdoor enthusiasts that seems a million miles away from the pavement and parties, but in fact is a short drive to from the Tahlequah Wal-Mart. Best of all, Elephant Rock camp stays open all-year-long so you can enjoy the truly great outdoor seasons in Oklahoma: Spring and Fall. The water level was up just enough to make the journey from No Head Hollow to the Highway Bridge with only one portage. The one portage was a few steps on the gravel bar due to a downed tree in an area where the current wasn't very swift. With the water level this high, I'll bet you could make the whole trip from Chewey Bridge to the Highway Bridge in two days easily with little portaging. Better get on this water soon, before it is gone again! Stop by sometime and meet Rod and Susan Foster at Elephant Rock Nature Park, whether you are looking for tent camping , yurts, canoes, kayaks or shuttling...they offer a uniquely, earth-friendly, family-friendly alternative to the familiar Illinois River camping scene. Next time I get a free moment, I'll tell you about the side trip we made on the way home...to the Port of Muskogee. My boss is out of town this week, so pardon my lack of posting while I try to fill his shoes. This weekend Dianne and I returned to Eufaula Lake for some RV camping at Gentry Creek campground. We were lucky enough to catch some nice weather and enjoy tour choice of campsites. Gentry Creek closes up for the season at the end of October. These days it is practically empty. The RV sites at Gentry Creek campground are mostly asphalt and rather narrow but shady and clean. Expect to have some leveling issues on a large RV. Hookups are water and electric only and most sites have a BBQ grill, fire ring and picnic table. One feature Dianne and I look for in a camping spot is not listed in most guide books. We call it 'distance to Wal-Mart'. Gentry Creek campground boasts a very respectable 12-mile rating on the Distance to Wal-Mart Scale. This came in handy when we realized that the campsite we picked was too far from the water hydrant for our hose to reach. If you go to Gentry Creek during the summer, you may want to bring a hose splitter as well, since some hydrants are shared over mutliple sites. The lake water was extremely wavy on this section of Eufaula this weekend. We had a fun trying to time our strokes with the waves to make the paddling easier. Large waves on Eufaula Lake can surprise you, so wear a PFD. (I didn't but it was hot OK? ) At sundown we got some pretty cool photographs, as usual you can check a few of them out on Flickr tagged 'Gentry Creek'. Many fishermen in my family enjoy this part of Eufuala due to the ease of catching shad for bait. I like it for the starry nights and the power line poles that seem to grace the background of all my pictures taken there. They make it easier to keep the horizon level. A friendly reader was kind enough to email me this week describing a trip he and his wife made down the less traveled portion of the Lower Mountain Fork River. It is a trip Dianne and I never seem to find time to take when we are in the Broken Bow area. 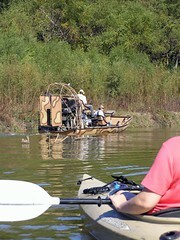 It is described as a flatwater float, but he said they managed to find a thrill or two...and much more wildlife! I have to get down there soon, but I think I maybe going to the Illinois River this weekend. Randy Clemens, of the Red Dirt Paddlers organization, just advised me that the Tulsa Wave Park will be given over to the city at 3 pm on Tuesday Oct 3. This is as big as it gets for Oklahoma are paddling news! Expect a big public event with the Mayor and other officals making statements. If you can ditch work to attend, come on out and show your support for this visionary collaboration between PSO and the City of Tulsa. Cheer for the new hottest new whitewater attraction in the Ozarks! This week the family to a very short road trip to the Checotah KOA. We are trying to learn the fine American custom of RV traveling and hoping tomake most of our mistakes close to home. Our first two trips in the RV seemed to bring the rain in so i am glad we kept it local. If bringing rain is a feature of this RV, then were really got a bargain! The Checotah, Oklahoma KOA is unique in that it offers kayak rentals for paddling Eufaula Lake. 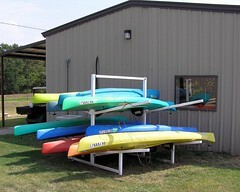 They have a nice sized stack of Dagger kayaks and they will shuttle you to and from their private put-in on Eufaula Lake. This top notch campground also offers shady RV sites, a nature trail, barnyard zoo, pool and restaurant. We spent one day paddling on the enormous Lake Eufaula and the next day we slipped down the road paddled the sandy banked North Canadian River from a put-in at Dogwood Acres. Although the North Canadian River is very low now, we still enjoyed some great scenery and wildlife. Sadly, the rainy conditions today left me with few decent photos to share. Get a Job Working For the Wildlife Dept. Act Fast! Ah, to spend my days enjoying the sweet embrace of Mother Nature. The Oklahoma Department of Wildlife Conservation will hold a standardized pre-employment examination Friday, Sept. 29, 2006 at the Tom Steed Development Center Auditorium at Rose State College. If you have considered working for the Wildlife Department as a fisheries or wildlife biologist, technician, game warden, or hatchery manager, I would highly encourage you to take the test. This year, Dianne and I decided that we could improve our camping and kayaking trips by purchasing an RV. We spent the last several months researching different types of RV's and asking questions. I asked all of the RVers I knew and Dianne did the same. We hoped to pick the right type of recreational vehicle for our family. As our adventures, mishaps and road education continue watch this blog for updates. We both agreed that we wanted a vehicle that was separate from the living quarters. Trucks come and go, but a trailer seemed likely to last much longer than the couple of years we usually keep an automobile. I wanted to aquire less than $30,000 in new debt. We each also had some key features we valued in recreational vehicles. For me it was Air Conditioning and for Dianne it was a bathroom. 1. Pop Up Travel Trailer - This was my first instinct as they are cheap and very easy to tow. Jayco is a market leader in pop-up travel trailers or tent trailers as they are sometimes called. I've seen used ones in good condition sell for just a few thousand dollars. Sadly, finding one with a decent bathroom requires moving to the top-of-the-line models in the $15,000 range. Costly, but just barely affordable if I could get a tow vehicle for around the same price. 2. Van - Dianne's Mom had bad experiences driving a van 'back in the day', so vans were ruled out pretty early on. 3. Truckbed Camper - We looked at one of these about a week before buying our travel trailer. The pop-up hybrid camper models are impressive, but we really wanted to save the back of the truck for our kayaks. 4. Bumper-Pull Travel Trailer - Most travel trailer these days are of the Fifth Wheel variety pulled by a gooseneck fitted truck. However, there are still many travel trailers you can pull with a trucks trailer hitch. This leaves the bed open for carrying other cargo. 5. Toy Hauler A.K.A. Sport Utility Trailer - This is what we finally decided to buy, a new type of bumper pulled travel trailer. Toy Haulers are like other travel trailers but they are made to haul motorcycles or other toys in a sort of attached garage. The entire back of the RV is a giant door that lowers to become a ramp. This allows you to keep your toys both locked up and dry. The one we took home is a 24-foot long Winner's Circle SRV made in 2005. For the same price as a pop-up we had been looking at, we picked up a used toy hauler. It has a full bathroom, central heat & air, 3 beds, oven, stove, microwave and stereo...basically all of the comforts of home. The tax folks even say that I can deduct the loan interest from my annual taxes...sweet! Once we picked it out, we had to get a suitable tow vehicle to pull it. We traded in Dianne's Mitsubishi Eclipse and got ourselves a 2002 Silverado 4x4 truck. Of course, neither my wife nor I have ever driven anything as large the Silverado pickup, much less the truck pulling a 24' travel trailer. We read several articles on trailering and worried for about a week. On the day we went to pick it up, I brought my camera in case we have crashed into anything on the way home. We figured that, as long as we took it slow, our only risk was scraping up against stuff...nothing life threatening. In fact, we made the trip from Tulsa to Okmulgee without incident. The good folks at Dean's RV in Tulsa had fitted our new Chevy Truck with lots of new load distributing and braking control gizmos that made the drive much safer. Since it was Thursday when we brought it home, we planned a 'dry run' to nearby Dripping Springs Lake to test out the RV and show it to our parents. Before the sun even set on Thursday, our son Dylan let it be known that an RV with no TV was a travesty in his not-so-humble opinion. Our first upgrade to the toy hauler was adding an $85 TV/DVD combo from Wal-Mart. Since it was too short notice to arrange a dog sitter, we brought Shally, our Black Russian Terrier , with us. The extra cargo area in a toy hauler leaves plenty of room for the dog to stretch out inside. We had hoped that having an RV would make setting out for a weekend outing go much quicker. However, perhaps because it was our first trip, we were lately leaving the house as usual. Once we arrived, just about at dusk, we were able to get the RV backed into an excellent space and setup pretty quicky. Dripping Springs Lake has excellent new RV sites with electric and water hookups. Our site was easy to back into, wide, level and clean plus it was right by the water. That evening we walked the dog under brilliantly clear and starry skies with lightening flashing on the distant horizon. It was breathtakingly beautiful and made me wish I had not forgotten and left my camera at home. That evening I slept like a baby in our cool and comfy travel trailer. Saturday, I woke up early and had a great paddle on the lake. The beaver and cranes were out in abundance. A light breeze blew across the lake and the morning sun came up all golden and sparkling on the water. As the warm sun chased the morning mist off the water I paddled to a secluded cove and watched the birds fishing in the shallows. I enjoyed the privacy immensely...and not just because I had accidentally set off truck's security alarm shortly before paddling out. Oh well...everyone likes to get up early when camping anyways, right? Hunger for food and home roasted coffee drove me back to camp after few hours. We love our Cafe' Driveway Blend Coffee and apparently it is good for us. Also, I wanted to tidy up a bit before our parents started arriving for tours of the new camping accommodations. Cleaning up the RV was pretty fast and easy since we had been doing most of the cooking in the microwave. The coffee was excellent, but not excellent enough to keep Dianne and me both from falling asleep until my Mom knocked on the door. Open House Saturday Ends with a Crash! Mom and Dad sat came in and sat down at the dinette that converts into a bed and I grabbed a seat on the couch that converts into a bed. We had just started talking about what a great RV it was when the couch collapsed on the side I was sitting on. I landed in a heap on the floor as two aluminum pop-rivets 'popped' right out onto the floor. I looked all through the trailer and I could not find another part that was pop riveted in place. It would appear that someone had done a hasty repair job on the bunk before I purchased it. I'm hoping I can repair it myself. Dianne's Mom also came to see the new trailer, but the crash and burn of the couch had taken much of the impressiveness out of our Grand Tour. We decided that after an embarrassing mishap like that, we probably had the worst of the trip behind us. Then, the thunder started. Our Dry Run turned out to be a bit wet a real windy. A few folks had tornados in their yards, so we couldn't complain about a shaky night in the RV... but our dog was less forgiving. She hasn't been in the RV since! Interested in missing work, spending a fun day floating the river, and enjoying a free lunch, all while helping our Scenic Rivers? The OSRC`s final cleanup of the summer is scheduled for Friday, September 8th. This cleanup will help get the river in great condition after a busy summer season. Participants will be given a free t-shirt and have the chance to win great prizes including two Old Town kayaks! There will also be a hearty lunch for participants after the day`s float. To pre-register for the cleanup, call or email Meredith at the OSRC: (918) 456-3251 / osrc2@fullnet.net. The deadline for pre-registration is Tuesday, September 5th at 5:00 pm. Wednesday, August 23, 2006, Meredith Lee, Education Outreach Coordinator. I'm sorry to say I have been neglecting all of my blogs lately to pursue the aquisition of a travel trailer for our family (more on that later). Also, Dianne and I have been having fun with a new hobby - roasting our own coffee beans! 1. Old Hot Air Popcorn Popper from the 80's. Didn't think they still made these? They do. If there was ever a piece of eightees technology that needed a complete makeover, it has to be the hot air popcorn popper. Instantly stale popcorn in only minutes! Luckily it makes a great little coffee roaster and the price is SO right. 2. Gourmet Green Coffee Beans - We used Guatemalan Beans and Costa Rican Beans because we love them and we were getting tired of driving all the way to Tulsa to get them! Did you know that Tulsa, Oklahoma is the headquarters for Java Dave's Coffee? I know we must not be the only Oklahoma home coffee bean roasters. 3. A Wooden Spoon, a couple cereal bowls and something to store the roasted beans in after they cool. 4. Advanced Accessories Optional - Power strip, extension cord, Bean Can. The roasting process is simple but fun. Take the measuring cup that comes with the popcorn popper and grab a scoop (1/3 to 1/2 a cup) of green unroasted coffee beans and dump them in the top of the popper. Throw away the plastic cover that came with the popper, you won't need it and it will get in the way. We replaced our plastic cover with a cleaned out Ranch Style beans can opened at both ends. It creates a little chimney that keeps the beans from flying out of the top of the popper...mostly. DO NOT ADD OIL. Coffee beans are loaded with oils of their own. Don't go crazy looking for the On/Off button on an old 80's model popcorn popper - you just pull the plug when finished or invest in a power strip. Keep stirring your beans often as they heat up, this whole roasting operation won't take but about 5 minutes and they can easily burn if not stirred frequently. I just shake the whole roaster occassionally to get the beans heating evenly. Listen carefully as you roast your beans. As soon as you turn on the popper the beans will start floating around in the popper and rattling. Within in a minute or three you will here a different kind of 'cracking' sound and the beans will be rather light to medium brown. Coffee Roasters call this the 'First Crack'. You can stop the roasting process now and cool them beans for a light to medium roast. If you keep stirring, heating and listening to them for a minute or two more you will hear a more pronounced 'crackling'... almost 'sizzleing' sound and the beans will be dark brown or blackish. This is the 'Second crack' or Dark Roast that is very popular among coffee buyers these days. After a good dark roast the beans will look wet as the oils have risen right up to the surface of the bean. I think it looks pretty cool. Cool your beans as quickly as possible. Like bacon just out of the pan, the beans will continue to roast until they are cooled. If you don't cool your beans quickly enough you may over-roast them accidently. I cool our beans by pouring them from cereal bowl to cereal bowl slowly. This also helps allow the wind to blow away the chaff. Don't roast the beans inside your house. The machine constantly blows out whispy bits of chaff the will make you home a mess if you roast inside. Also, expect to smell like coffee roasting afterwards. Why Roast Your Own Coffee Beans? Quality - Old hot air poppers are now pouring out of the garage sales to begin new lives as home coffee roasting machines. After reading about it in several sources, Dianne and I decided to give it a try. The short story: we love it! It simply produces the best tasting cup of coffee you can find anywhere! Time Together - We find that our son sleeps much better at night if we don't stay up watching TV. In our small house, it is probably the noise that keeps him up. Recognizing this, we Dianne and I try to use the time for grown-up talk in the driveway. Now he sleeps more and we talk more. Fun - My folks used to use quiet time like this to pick out pecans, shell elderberries or shuck corn, but we don't garden much. Roasting our own coffee beans in the driveway has become our nightly ritual. Savings - Drinking the best coffee EVER costs us about $5 per pound, now that we buy the green beans 25lbs at a time. There is no telling how much gas we save. The coffee is still not as cheap as Folgers, but much cheaper than any boutique coffee bean retailer. We like to blend about 2/3 medium roast with 1/3 dark roasted beans for our 'Driveway Blend'. We rarely blend the different coffee bean varieties together, but one blend we like is 1/3 dark roasted Ethiopian Yirgacheffe Beans and 2/3 light roasted Costa Rican Beans. We store our coffee beans for two days in disposable Ziplock Containers and then we grind them up, let 'em rest overnight and rave over the results the next morning. There are loads of places to buy your Green Coffee Beans for home roasting and the rest of the stuff needed is usually free. I hope you give home roasting a try, it is a great way to save a little money on gourmet coffee and have some fun learning about the coffees of the world. It is also a nice way to spend the evening with your family that will give you something to look forward to in the morning! Hundreds of people who were going to be in the Turner Falls area this weekend will have to go somewhere else, officials said. A massive wildfire in southern Oklahoma produced clouds of thick smoke Thursday, forcing authorities to close 15-mile sections of Interstate 35 and a parallel highway, U.S. 77, near the Arbuckle Mountains. 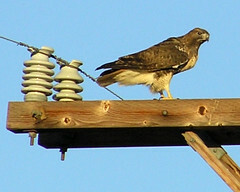 Log on to WildlifeDepartment.com to register for the Wildlife Expo - and a chance to win great prizes! One lucky person will win a John Deere ATV and another will win a lifetime combination hunting and fishing license, by simply registering for the Oklahoma Wildlife Expo. When you register at wildlifedepartment.com you will be entered in an exclusive drawing for a lifetime combination hunting and fishing license and a John Deere ATV from P&K Equipment. Thanks to generous sponsors, more than 50 annual and lifetime hunting, fishing or combination licenses, as well as other great prizes, will be given away at the event. Registration is quick and easy - so take just a few minutes to complete your information. After all, the odds of taking home an ATV are much better than winning the Power Ball, and it's free. - Melinda Sturgess-Streich, assistant director of administration and finance. The Oklahoma Department of Wildlife Conservation is partnering with a wide range of other state agencies, private individuals and outdoor-related companies to host this huge event. The Expo is designed to promote and perpetuate the appreciation of Oklahoma's wildlife and natural resources and provide hands-on learning opportunities for all types of outdoor enthusiasts. The free Expo is designed as an entertaining and educational event for both avid outdoor enthusiasts and those new to hunting, fishing and other outdoor activities. Every visitor will be sure to find something that interests them, from live butterflies, to mountain bike riding, to dog training, to sampling wild game. Don't miss the kayak demos the Oklahoma Outdoor Network will be putting on! The free Wildlife Expo will take place Aug. 25-27 on the expansive grounds of the Lazy E Arena, just north of Oklahoma City. Expo hours will be from 3 p.m. to 8 p.m., Friday, and from 8 a.m. to 6 p.m., Saturday and Sunday. Join the OKC chapter of the Arkansas Canoe Club on a paddle down the Lower Mountain Fork River in SE Oklahoma. The water is great for both beginners and pros alike and is nice and cold in the summer. Please get in touch with Randy if you want more information. Arkansas's oldest annual water event will take place in Batesville Aug. 4-5 at Riverside Park. The 63rd Annual White River Water Carnival will includes numerous features such as arts and crafts, foods, entertainment, sporting events, a car show, bike show, and a Grand Parade. For more information, phone (870) 793-2378 or e-mail jessika.stites@mybatesville.org.